Koleys Inc., Wrought Iron with Brass Sockets Advent Wreath. Wrought Iron with Brass Sockets and Bobeches advent Wreath. 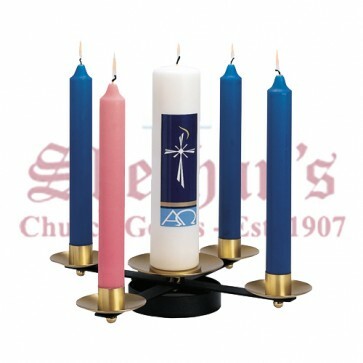 Plain yet elegant this church advent wreath measures 3" height, base 5 ½", 18" diameter and 1 ½" sockets. Christians use the tradition of advent wreath as a part of their spiritual preparation for Christmas during the season of Advent, the liturgical period preceding Christmas , beginning on the fourth Sunday before Christmas. An advent wreath is usually a ring with holders for 4 candles decorated with different variety of evergreens, signifying continuous life. Usually three of the candles are violet-coloured, and one is rose-coloured. Increasingly, due to changes in the Church's lectionary in the United States, all four candles may be violet. When used in household devotion, one violet candle is lit on the first evening of Advent (a Saturday). On successive Saturdays, the second violet candle is added, then the rose candle, and finally, the third violet candle. Some Anglicans and Lutherans use blue candles rather than violet. Some wreaths have a larger, central fifth candle (generally white), which is lit on Christmas Day to signify Christ's birth.